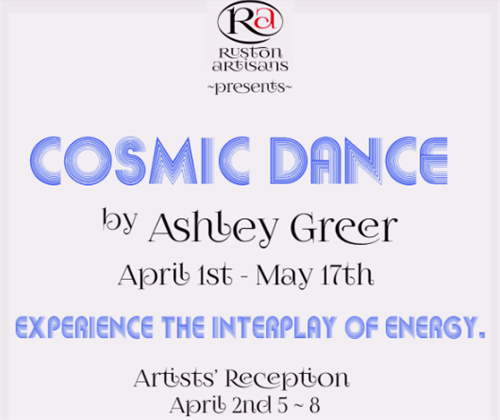 The Cosmic Dance Exhibition featuring Ashley Greer is in celebration of Ruston Fashion Week with artwork that is to be viewed with 3D glasses to experience the interplay of energy. An Opening Reception with an artist talk will be held Tuesday, April 2, 2019 from 5-8 pm at Ruston Artisans Gallery, 203 W Alabama Ave in beautiful, historic downtown Ruston. The Exhibition will run from March 30 - May 17, 2019. The gallery is open Wednesday and Thursday from 10am-5pm and Friday from 10 am-4 pm. Free & Open to the public. Refreshments will be served. Ashley Greer’s art style is inspired by the famous artist Jackson Pollack, who was among the leading figures of twentieth century art and among the most influential artists of the art movement Abstract expressionism. Her Cosmic Dance artwork features images of fashions, styles, and designs incorporated with today’s technology. Ashley Greer moved to San Francisco, California in 2014 to attend art school in hopes of becoming a more skilled artist. The city itself was an art school, where she learned many techniques, ideas, and perspectives. The diversity and high level of creative, intellectual thinking greatly enhanced her style, imagination, and perception. The city taught lessons of individuality that influenced her art to grow more bold, vibrant, and original. She attended her first art exhibition at SFMOMA featuring Keith Harring. It was then that she understood the power of the artist’s role and the great responsibility to be of service to humanity. In a concrete jungle, surrounded by money-motivated action, she found a fire to fight against the dehumanization of our culture and install more love on the planet.